When the December 2017 Thomas Fire struck Meher Mount, it set in motion a regeneration and renewal process beyond fire recovery. On the surface, the fire damage seemed to be modest. Below the surface, the fire stirred a new creative energy that is moving in all directions. Baba's Tree suffered major and irrevocable change. Winds and fire shattered the tree's crown and burned most of the trunk. The weakened trunk split, toppling several major limbs to the ground. But, the creative energy and the energy of Baba's Tree persists. The wood from Baba's Tree has been salvaged, milled, and stored for future use. 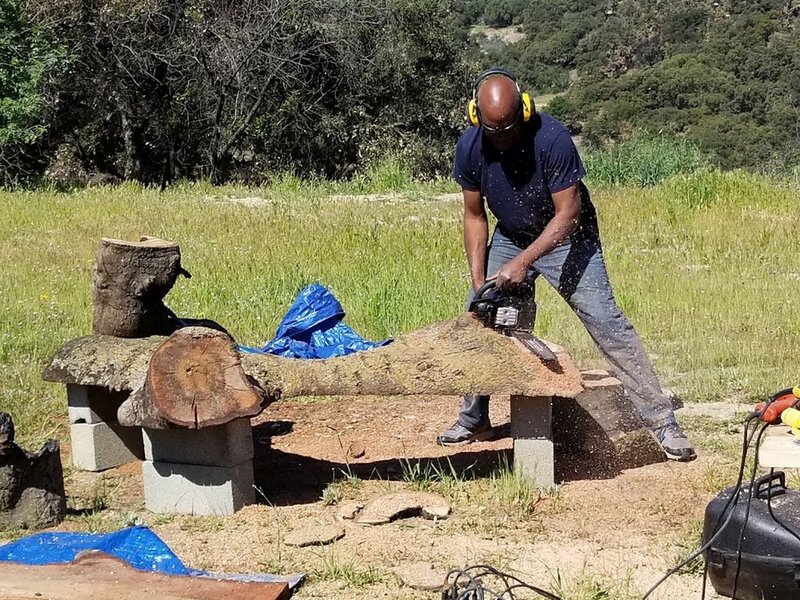 For immediate use, Meher Mount worked with artisan Harold Greene to create three outdoor benches from Baba's Tree to be placed near Baba’s Fireplace. Baba's Fireplace is the only remaining man-made artifact from Avatar Meher Baba’s 1956 visit to Meher Mount. All other buildings, memorabilia, and machinery were destroyed the 1985 New Life Fire. When the fallen wood of Baba’s Tree was milled, three uniquely shaped logs were partially cut into planks of various thickness. The the bottom half of each log was not milled and left to be made into benches for use at Meher Mount. “You never see so much wood with this kind of opportunity from a single tree,” said Harold. Given that these benches are to be used outside, the wood could be used immediately without waiting for it to dry and cure. 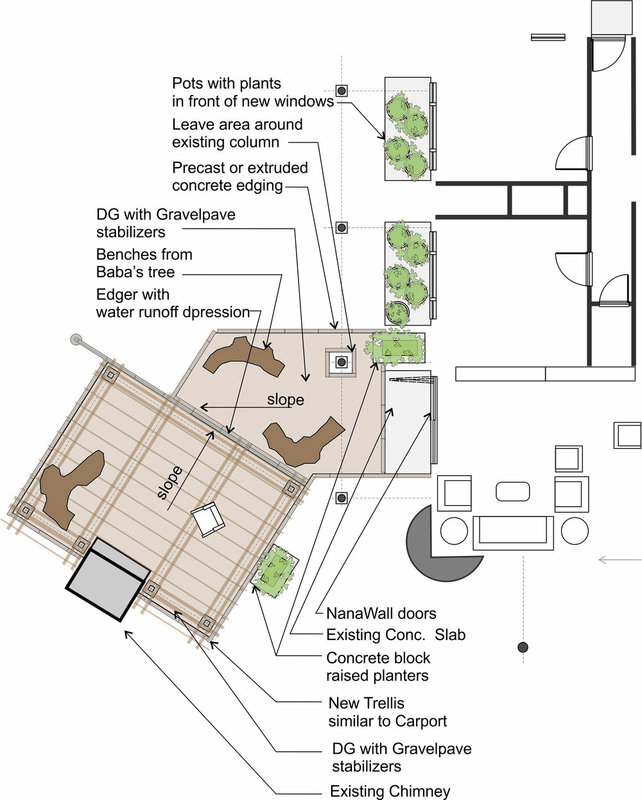 In February 2018, Harold Greene, the artisan furniture maker who had guided the milling process for the benches, submitted a conceptual drawing for creating the benches. On April 20, 21, and 22, 2018, Harold Greene, whose company is Antiques of the Future, came to Meher Mount to make these half logs into beautiful, organically shaped benches. 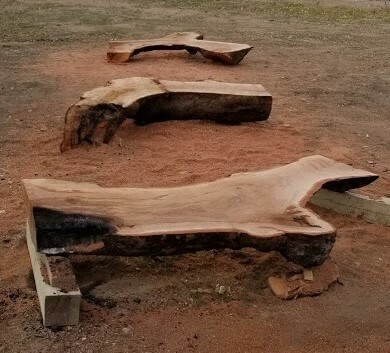 Using sections of smaller, burned limbs as “legs,” he attached them to the milled sections, sanded off the rough edges, and created natural, organic benches. Each bench tells a story about the life of Baba’s Tree. You can see the grain and growth pattern, areas that were burned in the fires that struck the tree, sections that were invaded by a fungus, and a limb that had a steel cable running through it. It’s all beautiful. These benches are currently by Baba’s Tree at Avatar’s Point but will be placed near Baba’s Fireplace when the area is ready. Two different newspaper reporters/photographers, who have been following Baba’s Tree, visited during this process to interview Harold and photograph the process: Writer/photographer Perry Van Houten from the Ojai Valley News and writer Claudia Boyd-Barrett with photographer Juan Carlo from the Ventura County Star. The unveiling of three new benches from Baba's Tree is an opportunity to celebrate Meher Mount's regeneration and renewal. You are invited to this open house. There will be a special arti (songs, prayers, quotes, poems) inside the seclusion fence for Baba's Tree. The event also marks the "official" re-opening of Meher Mount following the December 2017 Thomas Fire. Click here for more information on the event.